No one is descended from Captain John Smith, the brassy leader of early Jamestown. Many would like to claim descent, but the truth is that, according to documents, Smith never married or fathered any children. However, Smith did claim to have “children”—England’s New World colonies. He wrote, “I may call [the colonies] my children for they have bin my wife, my hawks, my hounds, my cards, my dice and in total my best content.” Smith wanted the colonies to succeed for England, but also because he had invested so much of himself in them. Smith was qualified for leadership in a new settlement. He was born a yeoman with a yearning for adventure. His early travels took him to Europe where he and other Englishmen fought with the Dutch against the Spanish. Back in England, he studied the art of warfare. Then, late in 1600 he decided to join the Austrian forces fighting against the “infidel” Turks in Hungary and Transylvania. He beheaded three Turkish officers, but then was captured and sold as a slave. He escaped and traveled through Russia, Poland, and Morocco before returning to England in 1604-05. 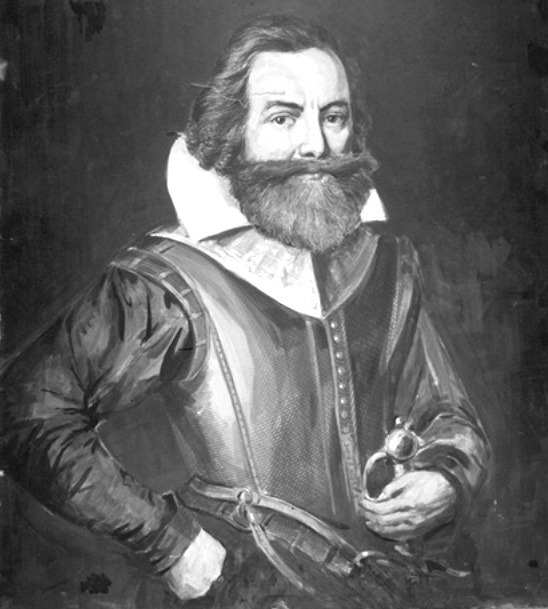 When the Virginia Company recruited settlers in 1606, Smith volunteered. He was the youngest among those chosen to lead the new colony, but also was the most traveled and most experienced in the practical training relevant to leading a colony in the wilds of North America. But events on the voyage to Virginia changed circumstances among the soon-to-be settlers. Apparently at odds with some of the gentlemen, Smith was charged with attempting to organize a mutiny and was restrained for most of the trip to Virginia. On arrival at Cape Henry in late April 1607, the names of the seven-member council were read. One of them was Smith, still restrained. Released in early June, Smith took his place on the council. Within a few months he was named Cape Merchant, in charge of procuring goods and supplies from the local environment and the Indians. That same fall of 1607 problems developed between and with the members of the council—President Edward Maria Wingfield was accused of hoarding supplies for himself, and was deposed and placed in restraint on the Discovery, anchored in the James River. Captain Bartholomew Gosnold died during the first fall from illness. Captain George Kendall was executed on charges of mutiny that fall. The remaining council members made attempts at replacing these men, but gradually, within a little more than a year, Smith was the sole remaining councilor and lead man in charge. Smith explored the Chesapeake Bay area twice, recording his observations in written descriptions and on a detailed map. He developed his skills as a trader and diplomat through encounters with Powhatan tribes. He successfully survived capture by Powhatan’s warriors in December 1607, returning to the fort to tell about it. Numerous times after that he met with Indian leaders to entice them to trade with him for food desperately needed by the English. In the fall of 1608, he became president of the colony. In this office he strengthened defenses, enforced discipline, and continued to seek food from the Indians. He forced men to work if they wanted to be fed. He trained them in military skills and dealt effectively with the Indians in trade and political negotiations, until his strongarm tactics angered local tribes as well as his own countrymen. When former colonists and antagonists Gabriel Archer and John Ratcliffe returned to Virginia in late summer 1609, they apparently plotted to take Smith’s life. Their plot was foiled when he was badly burned in a gunpowder explosion and had to return to England for treatment. He left Virginia in early October 1609. Smith may have a reputation of being assertive and self-serving. However, his writings about the Powhatan Indians and descriptions of the land of Virginia have been invaluable sources for historians and ethnographers. 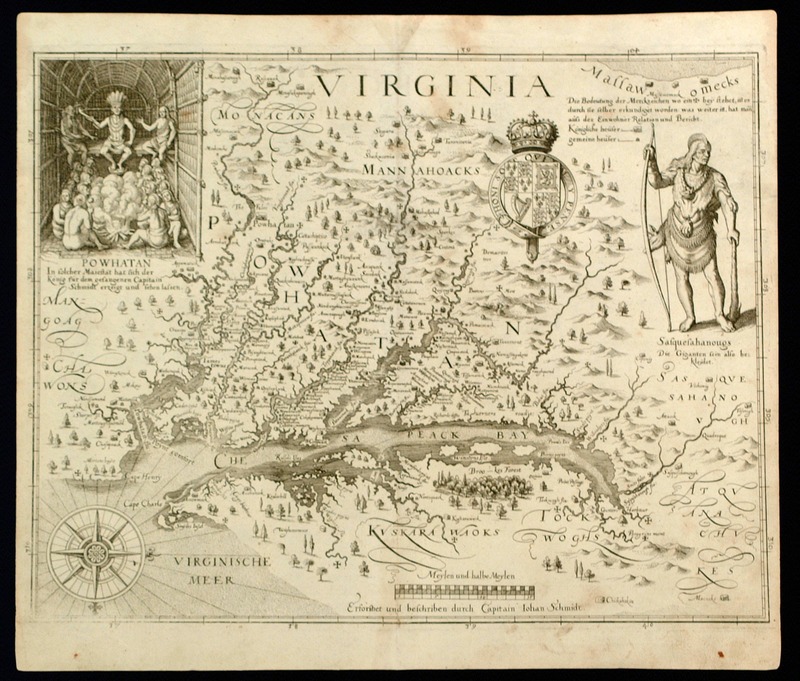 His map of Virginia was used by settlers to Chesapeake Bay for half a century. Barbour, Philip. Three Worlds of Captain John Smith. Boston, 1964. Smith, John. Complete Works of Captain John Smith. Ed. Philip Barbour. Chapel Hill: University of North Carolina Press, 1986. Vaughan, Alden. American Genesis: Captain John Smith and the Founding of Virginia. Boston, 1975. Historical background materials made possible by Archibald Andrews Marks.